The Brest region is located in the southwest of the republic adjoining in the west with Poland and in the south with Ukraine. It causes its favorable economic-geographical position. The transit corridor Berlin - Warsaw - Brest - Minsk - Moscow, the direct way to Vilnius and Kiev, the ramified network of railways allow to transport quickly. Brest has the international all-weather airport of 1st category with the runway in length of 2600 m.
There is the state national park Belovezha Forest Reserve with rich flora and fauna, opening to visit in this territory. Scientific researches to preserve the unique natural complex typical for Belarus and Europe are spent here. 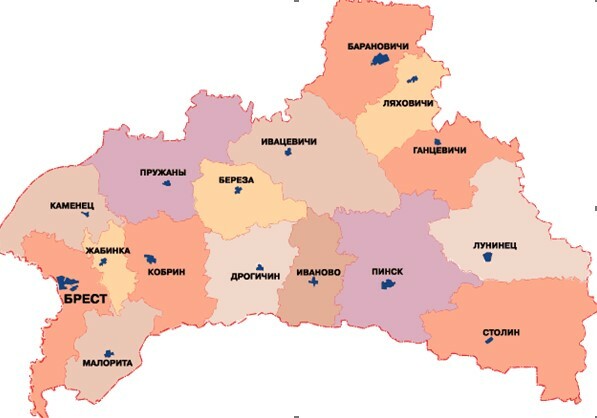 Brest, Pinsk, Baranovichi are the basic centres of tourism in the region. It was saved more than two thousand monuments of a history, culture and architecture on territory of the territory. The pearl of the Polesye is Pinsk, with well saved historical building, the catholic church and the Franciscans monastery, the Jesuit collegiums of XVII c. The original culture of Polesye was saved also. In many nooks it till now prosper potter's (Prouzhany), straw handcrafts (Astrametcheva) and weaving (Motol, Bezdezh). Many places are connected to names of outstanding Belarusian - the poet Adam Mitskevich, the artist Napoleon Orda, the national hero of Belarus, Poland, USA, the honorable citizen of France Tadeush Kostushko, the scientist Ignatiy Domejko and many others.